My edition: Paperback, to be published on 30th January 2014 by Phoenix (an imprint of Orion), 408 pages. Description: Max is the perfect son, the perfect friend and the perfect crush for the girls at his school. He's attractive, he's intelligent, he's athletic. He's even nice to his little brother. Max is going to make his parents proud. Golden Boy first caught my eye because it touches upon a subject matter I had personally not come across in fiction novels yet. Max is intersex and while initially he seems to cope with being different very well, something horrifying happens to him early on in the book which makes him question himself, his role in society and his future - up until the point that it becomes too much for him to handle. Admittedly I know very little about being intersex and so I was fascinated by the information within the story. In alternating chapters we not only see the developments through Max' eyes, but also through that of his parents, younger brother, girlfriend and a doctor, Archie. She was the one I mostly identified with, because as she was researching Max' condition she uncovered the vital information which made the reader understand the many facets of being intersex, and because of that Max, better. This is a unique and intense coming-of-age novel, almost too brutal at first as there is so much going in Max' life on top of being intersex but as the plot unravels it becomes clear why the author made the choice to go in this direction. It makes it a difficult read at times, but also a thought-provoking and rewarding one. The stunning UK cover (or at least the one of the proof copy in my possession) also deserves a mention as it is beautiful and eye-catching. It depicts Max in grey tints with a splatter of vivid orange text over his face and on the inside of the book. There are some phrases listed with the title "Blue-eyed boy or girl next door" which cleverly reflect Max' choices and conflict, though admittedly it also makes it somewhat confusing as Max is referred to as having green eyes. Golden Boy is an intense and profound piece of writing. It is one of the more rewarding and certainly most interesting books I've read recently and it I'm still thinking about it many days after turning the final page. I highly recommend everyone picks up a copy for themselves, because not only is author Abigail Tarttelin a great storyteller but the novel is also a fascinating and enlightening journey for both the characters and the reader. 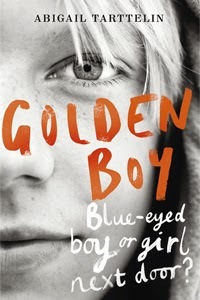 You can purchase a copy of Golden Boy from Waterstones, Amazon.co.uk, Amazon.com or your own preferred retailer.